Tinley Park loves it’s classic rock, which may be a bit of an understatement. From the amphitheater on the southern edge of town, to the village’s taverns, breweries and restaurants, to the stage of the Music in the Plaza series, it could easily be considered the backbone of our continually evolving and increasingly diverse music scene. If that flavor of music suits you, Five Guys Named Moe is not to be missed. THE MOES are the ultimate party band! 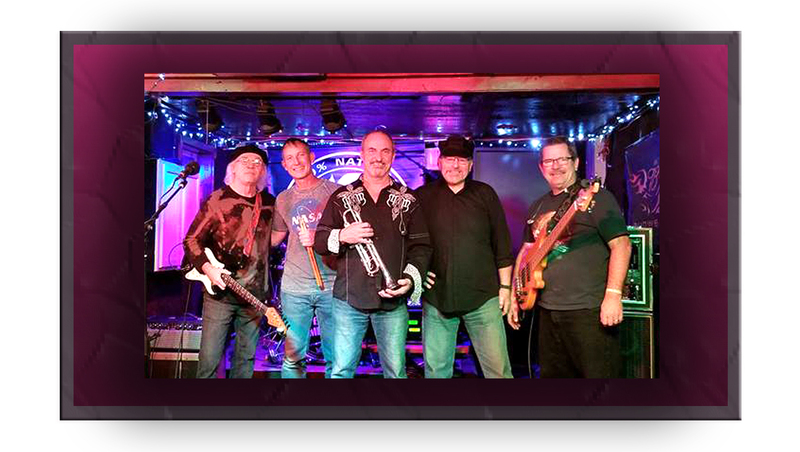 Five Guys Named Moe is a 100% all-natural classic rock-n-roll band that delivers pure energy, heart and a lot of soul! No additives, no preservatives, not from concentrate, just real music performed live before your eyes. 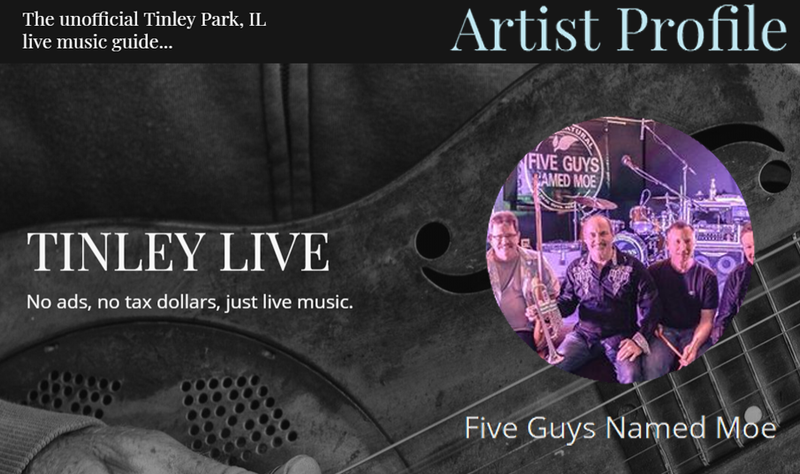 Five Guys Named Moe have shared the stage with many national touring acts as well as headlining concerts, festivals, clubs, corporate events and private parties through the Midwest. The group features four outstanding lead vocalist, magnificent harmonies, horns, percussion, and some of Chicago’s finest musicians. Prepare for a night to remember, the Moe show is a nonstop party! Five Guys Named Moe have a diverse repertoire and each show is different from the last. The Moes, one of Chicago’s top entertainment acts, have a reputation for being on time and easy to work with. The guys love to perform and it shows! Experience “MOE-OLOGY” for yourself and have Five Guys Named Moe at your next event! The founder / leader of the MOES. Jose’ serves as lead vocalist for the MOES, doubling on trumpet, flugelhorn, pocket trumpet, flute, bongos, congas, timbales and vibra-slap. Jose’s strong upper register horn playing dates back to his early days as Section Leader and Soloist for the United States Marine Corps, where he performed before Presidents and head of state between the years of 1972-1977. He traveled over 100,000 air miles a year touring the country and performing in 300 events per year. Along with sharing the stage with Trumpet greats Doc Severinsen at the Michigan State Fair and Al Hirt at the grand opening of the Superdome in New Orleans. Since coming back to Chicago, Jose’ has appeared with many local bands, from jazz bands to big bands as well as rock bands, marching bands even drum & bugle corps until he founded and formed the group Five Guys Named Moe. His natural talent on vocals, multiple trumpets, flute and percussion stems from his strong Latin Origin with a wee bit of Irish. Jose’s influences on trumpet include Arturo Sandoval, Rafael Mendez, Maynard Ferguson, Bill Chase, Al Hirt, Doc Severinsen, and Herb Alpert. 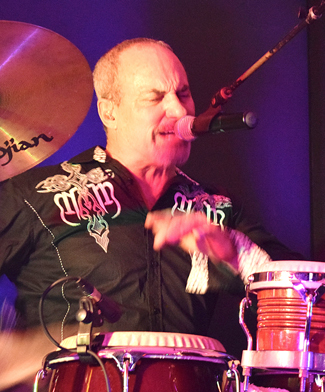 On percussion his influences have been Raul Rekow, Karl Perazzo, Armando Peraza and Joe Mesello. 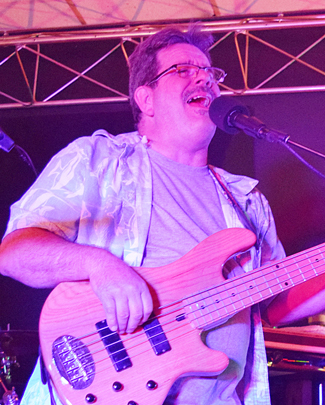 Bob provides the band with a strong bottom end bass sound as well as strong lead and background vocals. He has performed with various bands since 1973, first as a lead singer then doubling on bass and vocals after 1976. Some of the bands Bob has appeared in include Badge, Union and In-Sync. Bob has been with Five Guys Named Moe since the beginning. Bob’s playing styles cover pop, rock to swing and heavy funk. The main influences on Bob’s musical style are George Cassas, Tiran Porter and the always electrifying Jose’ Rivera! He’s a Monster on guitar! 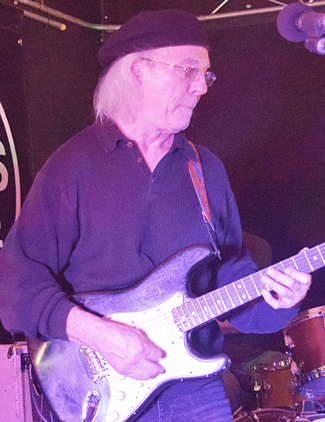 As an accomplished guitarist, Frank is experienced in all types of music. Frank’s most notable contributions have been in the fields of Blues and Rock. Frank was with a group called The Kind in the 80’s. They had two albums which produced several hits as well as they went on tour to promote their albums. Frank has toured with the following bands: The Kind, Lovecraft, Lonesome City Kings and Backstreet. Frank also has a discography consisting of six albums. Frank has performed, toured and/or recorded with the following artists: Freddy King, Buddy Guy, James Cotton, Jimmy Rogers, Muddy Waters, Howlin’ Wolf, Paul Butterfield, Sam Lay, Johnny Young, Eddie Campbell, Big John Horton and of course the always inspiring Jose’ Rivera! Allan was a member of the Moe’s back in the 90’s. Allan returns to the Moe’s after also being on a sabbatical. We’re all very excited about Ala Moe’s return. 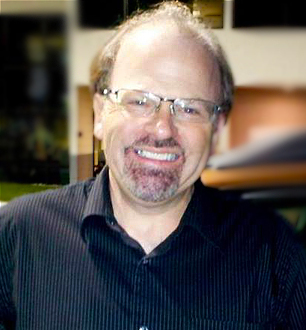 Allan began his professional career in 1979 as a member of Under New Management, top 40’s variety touring act. Upon returning to his hometown of Chicago, IL, he immersed himself fully in the jobbing and studio scene. Over the course of the next decade, Allan worked for a variety of cover acts, and also recorded with several original music projects. Allan has a B.A. in music from Columbia College, studying extensively with William Russo (jazz composition and orchestration) and Louis Hall (piano). Moving into the 1990s, he became a go-to player for several acts on the regional venue / festival circuit, including Five Guys Named Moe, Perry Danos & Backstreet and Frank Paul (Gone to Paradise). Throughout 1996-1997 he toured with the Roy Waddell band, based in Nashville, TN. His keyboard work was heard on radio and TV spots for Spiegel, Kraft Foods, Gerber, McDonald’s, et al. In addition, he composed and recorded music for area documentaries and industrial videos. He recorded and performed with several regional country and american artists, including Tim Teague (Jerrod Niemann), Frank Paul, Bert Cattoni and Roy Waddell. Allan’s influences include Bruce Hornsby, Bill Payne, Neal Doughty (REO), Rick Wakeman, Mike Garson (David Bowie), Todd Rundgren, Daryl Hall, Tom Howard and the always entertaining Jose’ Rivera! A graduate of Berklee College of Music 94′ in performance. 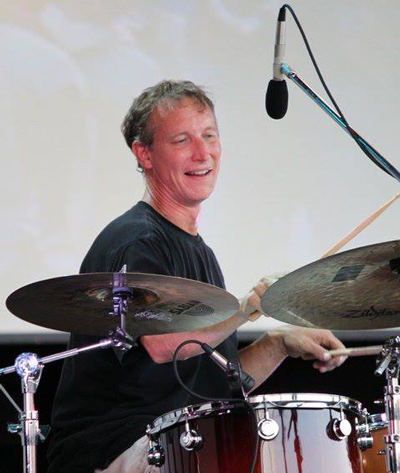 Paul brings over 20 years of experience in various styles of playing drums. Including Jazz, Latin, Fusion, Progressive Metal, Death Metal, R&B, Grunge, Pop rock, Hard rock and Blues. Paul has played with JP and the Cats, (pre-Berklee) for 6 months filling in for Jimmy Chamberlain of Smashing Pumpkins. He has played with Deep Blue Dream, Blues Victim, The Masses, Stawhouse, Lickity Split, Nova Soul, Joel Moore Quartet, Shawn Maxwell Quartet, Agnieszka Iwanska Group and most recently Five Guys Named Moe. Paul is influenced by the music of Frank Zappa, Led Zeppelin, The Who, XTC, David Berne, James Brown, John Zorn, Naked City, Masada, Bill Frisell, Yes, Rush, AC/DC, early Van Halen, Iron Maiden, Rammstein Gonzalo Rubalcaba, Tito Puente, Opeth, Meshuggah, Porcupine Tree, Miles Davis, Tony Williams, Pat Metheny, They Might Be Giants, Steve Coleman, John Coltrane, J.S. Bach and don’t forget about the amazing Jose’ Rivera! YES, WE CAN APPEAR AT YOUR PRIVATE EVENT! JUST ASK US!